Home » Thrifty NW Mom » Amazon Channels Free Trials (Get Free Showtime, Starz & HBO Trials)! Amazon Channels offers free trials to many premium channels, like HBO, Showtime and more. We have all the details on how to sign up for your free trials below, and enjoy Amazon Channels. These trials are a great way to have a movie night (or binge watch) over the weekend. They are also great to use for road trips, etc. to keep kids entertained! Amazon Prime has been a great way to stream movies and TV for some time now. My family subscribes each year, mainly for this purpose. 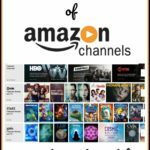 Now they are expanding on this service, and have added a service called Amazon Channels. Amazon Channels offers a number of premium channels that you can add onto your service for an extra fee monthly. Right now you can sign up to get free trials of many of these channels, and add them to your Prime Service to try out for free! This could be a great way to get free movies for the family, by taking advantage of some of these free trial offers. You can cancel at any time. If you have never signed up for these free trials here is a tip on how my family likes to use them. One way that I like to maximize the benefit of the Amazon Channels trials, is to sign up one at a time. This will provide me access to the free movies longer. For example I would sign up for the HBO free trial first, and once that has ended I would sign up for the Showtime free trial, etc. I also like to time my sign ups so my family can watch them over the weekend (or if we are planning a road trip and I want the kids to have access in the car to a movie, I might wait for just before our vacation to sign up. 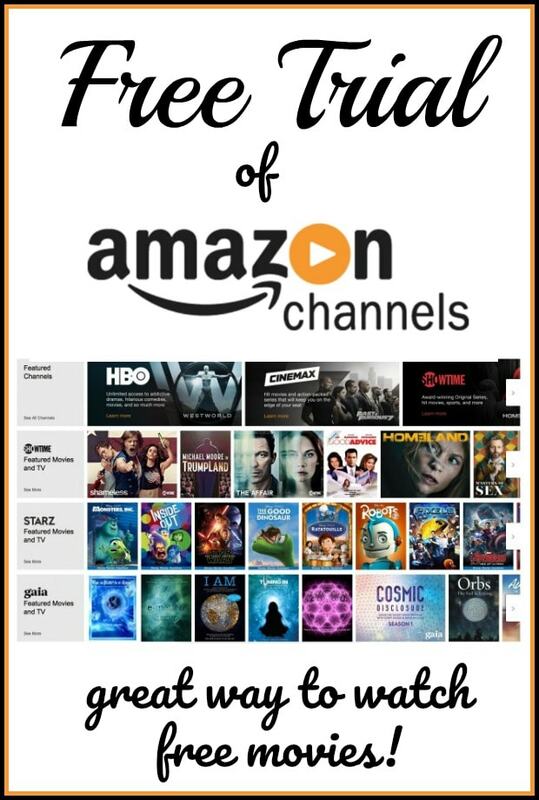 You must be an Amazon Prime member to get access to the Amazon Channels. Amazon Prime also has a free 30 day trial offer here you can sign up for, if you are not already a member. Amazon Channels is also a great option if you want to nix your cable bill. Many people are moving away from cable bills, and watching their shows through streaming options like Amazon Prime Streaming, Amazon Channels, and Netflix, so that is another option to consider. You can get a 7 Day Trial of HBO through Amazon Channels! There are a number of addictive dramas, hilarious comedies, and so much more when you sign up. With shows like Game of Thrones, Boardwalk Empire, and classic Sesame Street and a only to name a few of the great shows included. There is something for everyone. Signing up for the free trial is a great way to enjoy a weekend of family movie time. You can cancel at any time. If you choose to continue after the free trial, it will be $14.99 per month for an HBO subscription. Showtime is another amazing subscription you have to try! Enjoy it for 7 Days! Add it to your Prime Membership and enjoy original series shows, sports, movies, and more! Like the HBO trial, you can cancel this one at anytime too. After the free 7 day trial, a Showtime subscription will be $8.99 per month if you choose to continue with it. Enjoy a 7 Day Trial of Starz. Starz offers captivating original series along with hit movies too! With things classic tv shows and hundreds of movies you can watch live or by genre. Starz is $9.99 per month after your free trial, if you choose to continue with this subscription. Like both options above you are able to cancel at any time. There are other options as well, like Sports Illustrated TV, and PBS Masterpiece that are much more affordable. We just highlighted the most popular movie channels above, but there are a number more you can check out that are available too. All of these offers will help you enjoy some free movies and more over the New Year! Sign up for a trial of Amazon Channels, and you will have access to HBO, Showtime, Starz and much more! If you have an Amazon Prime Membership you can really enjoy all of the freebies through the promotion they are currently hosting with Amazon Channels. It is a great way to enjoy some favorite movies and shows that you otherwise have not been able to enjoy as a family! Add it right to your Prime Membership and you can view anytime and anywhere on any device! The membership program offers special benefits for a low monthly fee. You can also manage subscriptions via Amazon Video on any device and there is no cable or satellite account necessary. Watch popular TV shows and blockbuster movies! You get more of what you want for much less. Don’t have an Amazon Prime Membership? No problem! Sign up for your Amazon Prime Membership right here and start enjoying all of the benefits of TV right at your fingertips. January 7, 2019 at 9:30 PM Audible Trial & Audiobooks – 7 Free Books!